The push to bring more affordable housing to Buffalo is starting to pay off. Developers and political leaders celebrated three major affordable housing projects in Buffalo and Cheektowaga this week. The privately led AP Lofts in Larkinville formally opened Thursday while nonprofit officials also marked groundbreakings on the Elim Townhomes in Buffalo and the Apple Blossom Apartments in Cheektowaga. The three developments include more than $90 million in projects, largely supported by state and federal funds, aimed at meeting a need for more affordable residential options. The ventures will result in nearly 300 new apartments. The three projects are part of New York's $20 billion, five-year housing plan to build or preserve more than 100,000 affordable homes and 6,000 units of supportive housing, including multifamily, single-family and community development efforts. On Buffalo's East Side, the state has invested more than $112 million since 2011 for 1,217 affordable apartments housing more than 2,700 people. "We have said that the people of this community deserve to have beautiful, safe, secure, world-class housing right in their neighborhood," said Lt. Gov. Kathy Hochul, who attended both the AP Lofts and Elim events. "This is a smart place to invest your dollars, because this is just the beginning. We have waited a long time for this." Buffalo Mayor Byron W. Brown said the city has invested $42 million in affordable housing since he took office, leveraging $398 million in private development. "We are working to transform this community, and it is happening right before our eyes," Brown said. 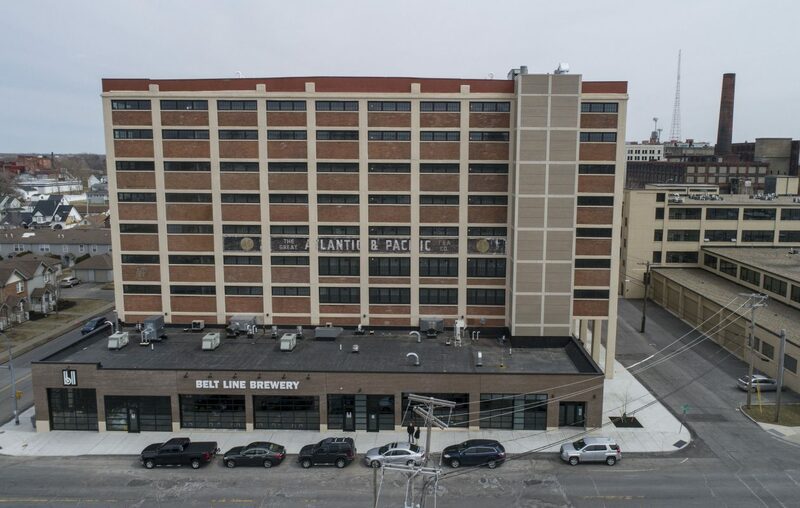 Indianapolis-based KCG Development completed its $42 million renovation of the former Atlantic & Pacific Tea Co. warehouse, transforming the eight-story building at 545 Swan St. into the new AP Lofts at Larkinville. That's adjacent to both Savarino Cos.' 500 Seneca project and the Seneca Street Lofts, developed by Frontier Group of Cos. at 550 Seneca, creating a trio of successful projects just a few blocks from the heart of Larkinville. The AP Lofts project came to fruition after previous proposals failed to convert the facility into an expanded Buffalo City Mission, and a prior redevelopment effort by another firm fell through. The complex features 147 affordable apartments and a new 4,100-square-foot brewpub and farm-to-table restaurant, called Belt Line Brewery & Kitchen. It also includes a community room and fitness center, a business center, an outdoor patio with a fire pit and a small dog walk park. It has two levels of climate-controlled indoor parking, with more than 108 spaces, as well as a small outside surface lot for visitors with another 40 spaces. The project took a largely neglected former daylight factory-style warehouse, built in 1910 but which had been vacant since 1975, and converted it into a mix of one- and two-bedroom loft-style apartments. Crews also carved out a central atrium into the middle of the building, to provide windows and natural light for interior units. Each unit has new stainless-steel Whirlpool appliances, granite countertops and islands, soft-close cabinets and drawers, high-end vinyl laminate flooring, and large windows, along with exposed wood ceilings and ductwork as well as the historic cylindrical columns that were hallmarks of the construction style. The project also preserved old factory and cooler doors, which were incorporated into the walls across from elevators. Most of the units are aimed at households at or below 60 percent of the area median income, but incomes for 28 of the units can be 30 percent above that median. Rents range from $540 to $1,499, while sizes range from 800 to 1,244 square feet. The project was designed by architects from Carmina Wood Morris PC, with construction by RP Oak Hill Development and Colby Development. The building began accepting tenants last August, even before construction was completed, and is now 98 percent occupied, with only two units still available. The project was funded with $6.5 million in tax-exempt bonds from New York State Homes and Community Renewal, as well as federal low-income housing tax credits that yielded $9.9 million in equity and another $8 million in subsidy. Additional state and federal historic tax credits resulted in another $11.35 million, while the city provided $975,000 in HOME funds. Boston Capital and Citigroup purchased the tax credits. This is the first project in the state for KCG, which focuses particularly on developing mixed-income and often mixed-use projects. The firm is currently doing planning work on another building in Buffalo that it has under contract, with a goal of a similar project, and is also working on ventures in Rochester and in Saratoga Springs and Amsterdam, both near Albany. 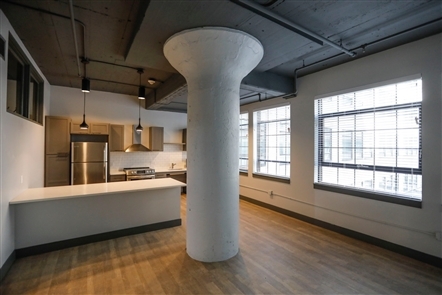 AP Lofts is one of its larger projects, and the largest adaptive-reuse venture of a historic building that the firm has ever done. "What’s really cool about these adaptive reuse projects is you really can be so creative and take a vision much farther than I think people realize. The risk is higher, but the reward is higher, and I think AP Lofts stands out as one of our most proud developments that we’ve done because it was such a challenge and we persisted," said Stacy Kaplowitz, the company's vice president of development. "It took us years, but we were committed." A 2017 rendering of the 30-unit Elim Townhomes project. Separately, Thursday, officials also noted the groundbreaking of the $10.7 million Elim Townhomes just off Main Street in Buffalo, led by Elim Community Development Corp. of Buffalo and Belmont Housing Resources for WNY. Located near the former Central Park Plaza that LPCiminelli is transforming into the Highland Park Village neighborhood, the Elim project will consist of five town house-style buildings with a total of 30 units. The apartments will be affordable for households with incomes at or below 50 percent of the area median. Six will be reserved for individuals with a physical disability or traumatic brain injury. The project will also feature on-site laundry, a community room and kitchen area, dedicated storage in each apartment, a playground, an outdoor seating area and on-site bicycle storage. Funding includes federal low-income housing tax credits that will produce $6.7 million in equity and another $3 million in subsidy, plus $900,000 in HOME funds from the city. 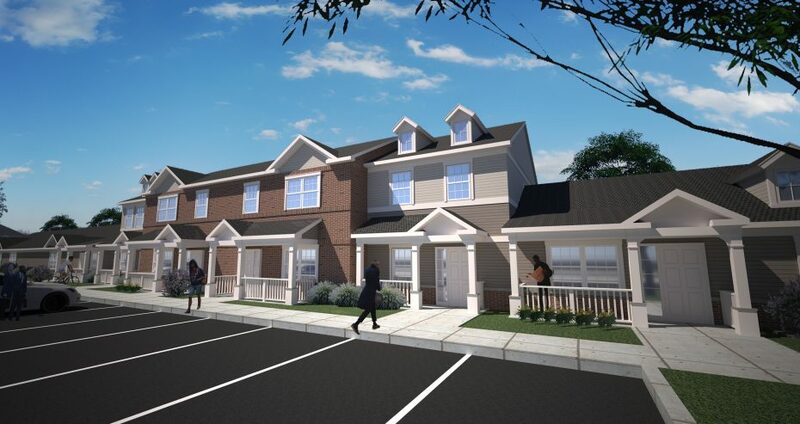 Finally, earlier this week, officials marked Rochester-based DePaul's new Apple Blossom Apartments, a $37 million affordable and supportive-housing project in Cheektowaga. Now underway, the project will include 110 apartments, with 48 set aside for individuals with mental illness, who will have access to help on-site. Plans call for three buildings named after New York state apples – Honeycrisp, Empire and Cortland – with two of them under construction while a third, existing building is being renovated and expanded. With rents ranging from $350 to $800 per month, the units will be affordable to households with income at or below 60 percent of area median income. Each building will include a community room and kitchen, lounges with computer access, laundry rooms on each floor and in-unit storage. The project also includes on-site parking and meeting space for medical and mental health care management services. The project is funded with $19.2 million in tax-exempt state bonds, federal low-income housing tax credits that will produce $9.7 million in equity and about $12.8 million in Supportive Housing Opportunity Program subsidies. The state Office of Mental Health is also providing $13 million in capital and a $120,000 project development grant, while the New York State Energy Research and Development Authority gave another $86,000.